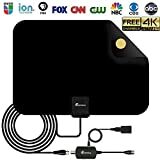 [2018 UPGRADED] HDTV Antenna - Digital Amplified HD TV Antenna 50-80 Mile Ran.. Selecting the right antenna is vitally important to ensure viewing pleasure. 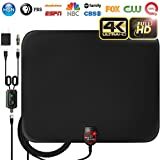 Whether you are planning on upgrading your outdoor antenna, are moving houses, or are looking for something to hook up to your portable TV in your RV, there is an antenna just right for you. Purchasing the wrong antenna for your location could mean a lot of dissatisfaction and therefore we have put together this shopping guide to make choosing as easy and switching on your TV! 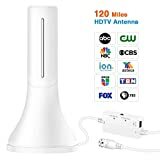 Indoor TV Antennas: These are easy to set up and perfect for homes in urban areas where there are no trees or other interferences with the signals. There are two types that vary in design depending on what suits your home better: Wall mounted (some flat enough to be hidden behind a picture or television set) and free standing. 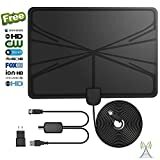 Free standing antennas stand near or on your TV and vary in shape and size. Small Antennas: These antennas are small, compact and neat. They come in multi-direction and directional. Multi-directionals are good for homes that aren’t too low and where signal strength is high. 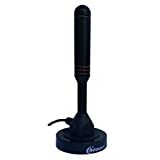 Small directional antennas offer great picture quality if your home is not surrounded by large buildings or other structures. 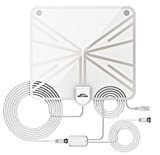 Medium Antennas: Medium multi-directional antennas are for when you have more than one device and need a stronger signal. They come in either stick, wing or disc shape depending on your preference and work great when installation may require more than 20 feet of cable. 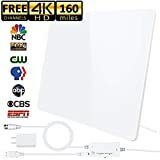 Medium directional antennas are the most popular rooftop antenna because of their size and are generally quite good at reducing ghosting, where your television displays two offset versions of the same image on your screen due to poor reception. Large Antennas: Large multi-direction antennas will work wonderfully in lower signal areas like the suburbs where stations are more spread out. They work best where the antenna can be mounted at heights over 30 feet. 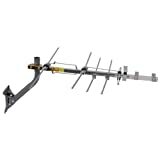 Large directional antennas offer the best TV reception in areas with very low signals. They are the best solution for individuals in rural areas living far from a cluster of broadcasting stations and when there are no significant mountains between the station and your home. Signal: When it comes to signal strength, reviewers rate this as a much more important aspect of their antennas than the way it looks. 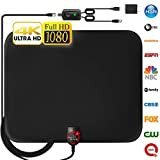 Choosing your antenna based on signal compatibility will ensure viewer and product satisfaction. Quality: People want their antennas to be able to stand the test of time and weather! Choose a high quality outdoor antenna that will be durable and dependable. Cables: Owners were disappointed with antennas that didn’t come with enough cables for installation, as this means additional costs. Check the lengths of cable you need versus what the antenna comes with, to avoid disappointment and extra costs. Installation: Whether you decide on indoor or outdoor, antennas that are easier to install and assemble save consumers a lot of frustration and are rated high. Visit AntennaWeb, co-sponsored by the Consumer Electronics Association and National Broadcasters Association, to look up your address and station distances to determine your proper antenna type. To make sure you buy the correct antenna, outdoor antennas are color coded to the area you live in. They are also color coded for what type of signal they can pick up. Green is good in areas where the signal is strong. Yellow is good for medium strength and red can pick up the weaker signals. Outdoor antennas, which tend to be stronger, are better for suburban or remote areas away from broadcast areas. If you are in the city and considering an indoor antenna, it is recommended to take wall thickness into account. The higher you place your indoor antenna, the better the signal will be. Many outdoor antennas are equipped with remote controls that make swiveling the antenna to seek out different signals a simple task. If you’re worried about style and making sure your antenna blends into its surroundings, choose an outdoor antenna that is small or can be installed in an attic. 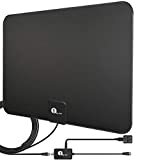 Or choose an indoor antenna that can be hidden away or mounted out of sight. If you want your outdoor antenna totally out of sight, some can be installed in attics, keeping your roof antenna-free. You will need a signal amplifier to place between your antenna and splitter if you have more than one TV and need to split the signal. 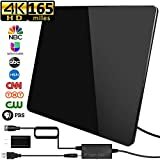 RCA: Founded as Radio Corporation of America in 1919, RCA is now a trademark Sony Music Entertainment and Technicolor manufacturing quality TV antennas. Mohu: Mohu is a spinoff of Greenwave Scientific and aims to make common sense consumer products. 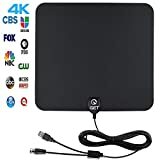 Their indoor Mohu Leaf antenna is the top selling and best reviewed consumer indoor antenna on the market as of writing. Winegard: Winegard started in 1954, has been awarded 67 patents to date, and invented the first Recreational Vehicle (RV) television antenna. Antennas Direct: Antennas Direct, from Ellisville, MO, sells direct to the public, ensuring quick and responsive feedback to all consumer suggestions and requests.